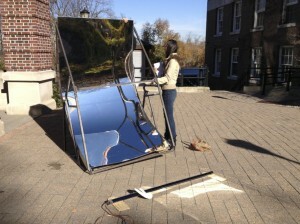 The solar reflector was set up on the landing between the Walker and Sage Laboratories. 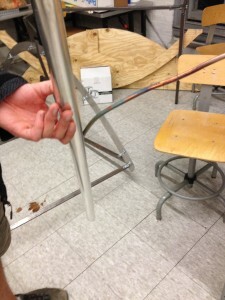 The metal frame was brought out as two separate pieces (the base and the rotating curve) along with the laminated reflector sheet and the reaction chamber. The metal components were assembled first as depicted below. 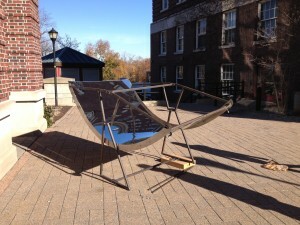 One of the greatest challenges of reassembling the reflector outside was attaching the metal sheet to the curved frame. If a gust of wind came between the two buildings, the large metal sheet would catch and shift out of the frame. Once in place however, the friction between the curves, as well as the support from the L-brackets, held the sheet in place. 2″ c-clamps were also used to fasten the ends of the sheet in place. Once the metal frame was assembled, we were able to add the reaction chamber. Wooden supports were made out of plywood to be bolted onto the base. The supports would hold the evacuated tube at the focal point. Due to slight distortions in the curve however, the focal point was slightly off center, so the evacuated tube was held manually. The glass exterior warmed up slightly with exposure to the sun and convective body (hand) heat, though nearly all of the heat concentrated on it by the reflector remained inside the tube. 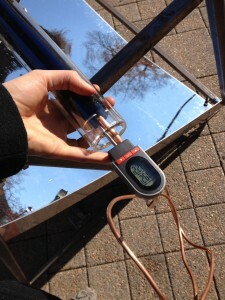 A digital thermometer was used to record temperatures at the end of the reaction chamber where the copper tube sticks out. The tube’s temperature rose to over 275F in twenty minutes before the thermometer malfunctioned and would not record any higher data. The collected data is shown below. After twenty-two minutes, smoke began to seep out of the reaction chamber. It was slow at first, though more and more began to come out and the fumes became noxious. Ethylene glycol within the tube began to leak out. It was difficult to tell whether the exterior epoxy-sealed end had cracked due to the fast change in temperature and pressure, or if the soldered end within the reaction chamber had melted. Both could have happened simultaneously. The reactor was removed from the reactor and put into the shade to cool down. The next day, after the reaction chamber and inner components had cooled down to room temperature the inner aluminum fin and copper tuber were removed. The soldered end of the copper tube had been completely melted. Black residue covered the length of the copper tube. It was unclear whether this was from the solder or the radiator fluid, or both. While the subsystem failure of the copper tube indicated that we had created a successful heating apparatus, it also proved that more safety considerations must be made. 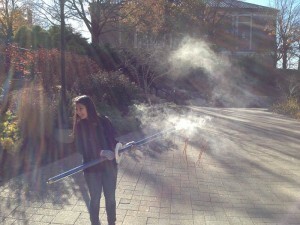 Ambient testing temperature was 50F with a windchill of ten degrees. If in Ghana, where the average temperature is around 80F. This higher heat may create higher pressures which may create hazard within the glass tube.